Whether you're looking to spend a weekend or a summer on Coronado Island, here are a few ideas to keep you occupied. Just outside of the city of San Diego is Coronado, a family-friendly island town full of history, ghosts, sailors, and good food. Here are a few things to know before you go. 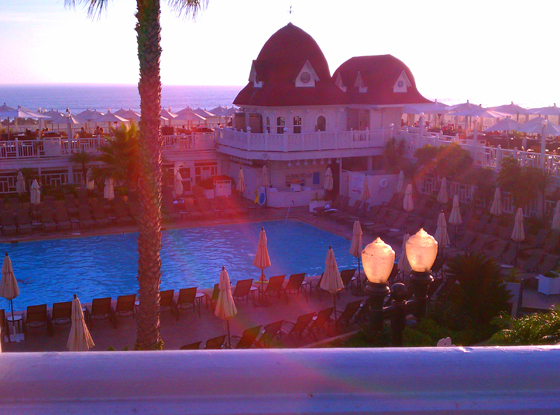 It seems that many things on this tiny island town revolve around the lore of the grand Hotel Del Coronado. This massive beachfront resort is one of the oldest of its kind in the United States, celebrating i's 125th anniversary this year. It's been visited by 11 presidents, and film productions have ventured south from Hollywood to film at the resort since 1901; it played an iconic role in the classic 1959 comedy Some Like It Hot, starring Marilyn Monroe, Tony Curtis, and Jack Lemmon. Sure, during the heights of the tourist season, this place can be a madhouse, but locals and visitors alike swarm the grounds for dinner, ice cream, shopping, lounging, or the decadent reservation-only Sunday brunch buffet. Of course any mention of the Hotel Del would be amiss without mention of the resort's most famous ghost, Kate Morgan (among the other storied spirits that supposedly keep a long-term residency at the hotel). She took her own life in 1892 at the hotel, supposedly after being jilted by her husband or lover. Her spirit lives on in the general eeriness and ghoulish pranks that some report upon setting foot in the hotel. If you're into things that go bump in the night, try downloading one of those ghost-hunting phone apps and take a trip around the hotel grounds. You just might meet someone — or something — new.